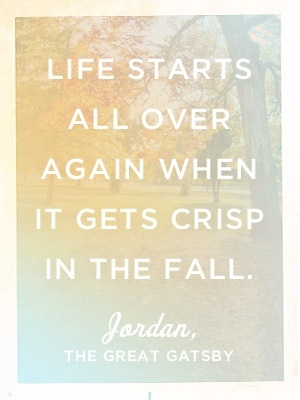 Far be it from me to disagree with F. Scott Fitzgerald on anything, let alone the wonders of the fall. I could probably write about 199,887 blog posts about why autumn is my very favorite season and how much I love it. I wouldn’t even know where to start, there’s so much autumn love in my heart. Instead, I’d like to share my autumnal bucket list. I was inspired by another blogger, scarletpen28, when she shared her own goals for the season. It got me in mind of Fitzgerald’s statement and thinking about how it somehow makes more sense to have a bucket list in autumn than it does in January. So, here’s my list of aspirations for my favorite time of the year. As you can see, some of them are seasonal and others are not. I hope you’ll create (and share) your own! Take a long walk outside at least 4 times a week. I’m already doing this about 2 times a week. It’s not just good for the body, it’s good for the spirit, especially now that the light is gold and the air is cool. Spend more time on the screen porch. Same reasoning. Make a more than decent effort at NaNoWrMo. I’m already dedicated to doing this with a friend on a collaboration project and I’m scared and excited. Complete a final, polished draft of one of my short stories and publish it on Kindle. Do a 1 week detox to kickstart my mommy-tabolism. Talk to all of my grandparents at least 2 times a week. Perfect a white chili recipe. Write 1-2 blog posts a week. Mix up my workout with something new-whether it be yoga or pilates or jogging every now and then. Find a tradition to honor the anniversary of my mom and Papaw’s birthdays. Be more deliberate about encouraging others. Introduce Kora to her mommy’s favorite season. So that’s my list. Maybe nothing big or crazy, but I look at it as a step further in many of the directions in which I am trying to move. Some of these directions are about forward progression, but others are about taking things slowly and making time to enjoy the present and remember the past. I find that autumn itself is like that-the blue skies and crisp air filling us with new ambitions, while the familiar smells of the season constantly evoke memories of other days. Do you have an Autumnal Bucket List? I challenge you to come up with 10-15 goals for the season!